They are known as female Ninja but they don’t do the same missions as male Ninja do. Unlike Ninja, Kunoichi sneak into enemy’s life by being a maid and collect information, sometimes assassin the target. 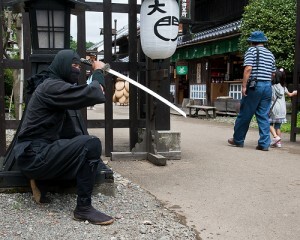 There are several places to see Ninja in Japan. Kouga Ninja Mura, Edo Wonderland, Ise Azuchi-Momoyama Bunka Mura are the amusement parks, where you can see Ninja shows or visit a Ninja house. At “Iga-ryu Ninja Museum,” you can see the Ninja tools they actually used long time ago. They also have Ninja show introducing how they used Ninja tools. P.S. Please check “Japanese NINJA [Part 1]”.